This beautiful image of an engaged couple tells us that a prenuptial photo session is all about ... going to beautiful places, having fun, and enjoying every second with the one you’re about to marry. An engagement photo session is one of the most exciting parts of wedding preparation. When the love of your life pops the question, the next important event to look forward to before the wedding day itself is the engagement photo shoot. An engagement photo session, although not required, has gained popularity in the wedding industry. Being less stressful than the wedding itself, it’s more exciting to prepare for this photo session. 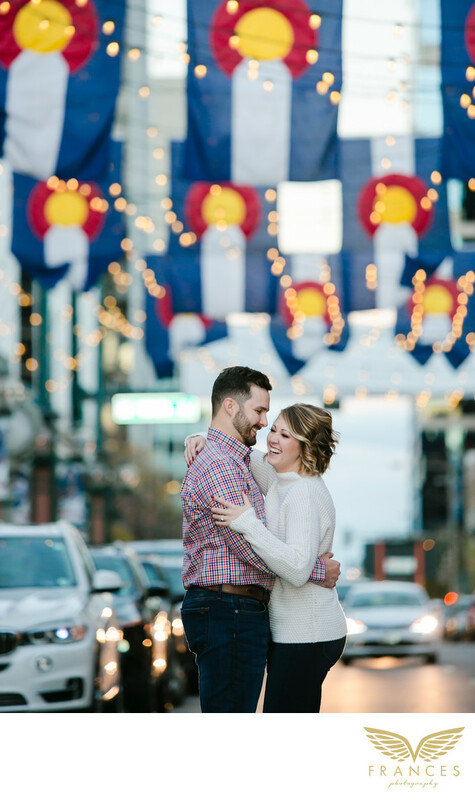 You’ll think about the theme of your engagement shoot, the location, the Denver engagement photographer you will hire, and the clothes you’re going to wear. This excitement building up inside you will surely explode into joy and happiness on the day of the photo shoot. As we see in this image, the future bride smiles so wide while posing for the camera. These genuine laughing moments are the one's photographer look for. They represent the light, fun, and joyful mood of an engagement photo shoot. The Colorado State flags hanging above the couple made this image even more beautiful.